A Smithsonian curator is traveling to Madison, Wisconsin, to document protests over proposed legislation there. (CNN) -- The posters and placards carried by Wisconsin demonstrators will soon become an official part of the nation's legacy, adorning the walls of the Smithsonian's Museum of American History. 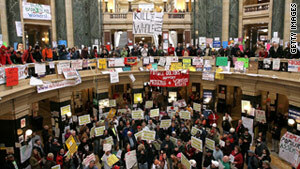 A curator is traveling to Madison, Wisconsin, to document protests over legislation that would curb the collective bargaining rights of most state workers, according to a museum spokeswoman. The bill prompted hundreds to occupy the state Capitol building for weeks as demonstrators chanted political slogans and waved banners against the measure. "If we don't collect these things now, they're lost forever," said Valeska Hilbig, a Smithsonian spokeswoman in Washington. The Smithsonian envoy, Barbara Clark Smith, will survey the state legislature and evaluate materials that tell the story of the showdown between a group of union-backed Democrats and their GOP counterparts, led by Republican Gov. Scott Walker. "This is part of the museum's long tradition of documenting how Americans participate in the political process," a statement from the museum said Tuesday. "We are the nation's museum," Hilbig added. "So we try to collect everything that helps to understand the national experience." The Smithsonian collection houses -- among other things -- artifacts from the nation's labor history, including one of the sewing machines seized in the El Monte Sweatshop raid in 1995, oral histories from longshoremen and tools used by railroad workers at the turn of the last century. The museum also houses accoutrements from the nation's first ladies, as well as presidential campaign buttons and banners from women's suffrage and civil rights rallies. But as historical artifacts are collected, history also unfolds. Walker on Monday dismissed as "ridiculous" a letter from a Democratic state Senate leader, who suggested meeting near the Wisconsin-Illinois border to discuss the budget impasse. Public employee unions have agreed to financial concessions, but argue that the governor's plan to limit collective bargaining is tantamount to an assault on workers' rights. Walker and Republican lawmakers are trying to close a $137 million budget shortfall with a plan that requires public workers, with the exception of police and firefighters, to cover more of their retirement plans and health care premiums. So far, nothing has worked to bring the Democrats back to the legislature. Whether one of those notices will join the list of effects in the curator's quest for history is unclear.